Alick George, the second Cubitt son, was born at his grandparents’ house (17 Princes Gate, Knightsbridge, London) on 16th January 1894. He was baptised at the adjacent church All Saints Ennismore Gardens on 20th February, the officiating priest being the Vicar of Bramley where his parents had a country house. His second name is after his paternal grandfather George Cubitt, lst Lord Ashcombe; it is not certain where the “Alick” comes from. In the 1901 census the seven-year-old Alick is at his family’s London home 20 Princes Gate, Knightbridge with his parents (the Hon. Henry Cubitt and his wife Maud) and four brothers: Henry Archibald (1892), William Hugh (1896), Roland Calvert (1899) and Archibald Edward (1901). 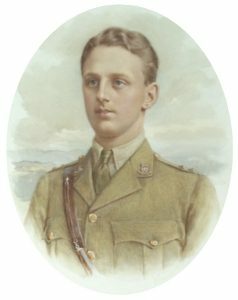 (The youngest brother Charles Guy was not yet born,) According to his obituary in The Times of 30th November 1917, Alick was educated, like his older brother Henry Archibald, at Stone House, Broadstairs, and Eton. In the census of 1911, aged 17, he is staying with his maternal grandmother Constance Calvert at her home Ockley Court in Surrey. Alick trained at the Royal Military College, Sandhurst. as a Gentleman Cadet. Commissioned as a 2nd Lieutenant, he joined the 15th King’s Hussars. 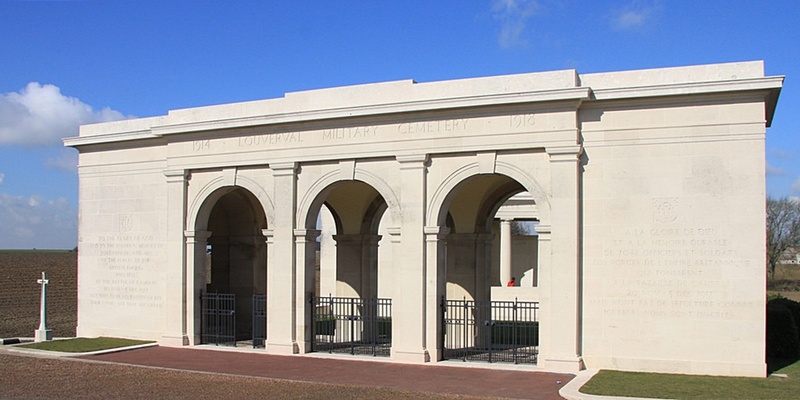 After the outbreak of World War 1, he went to France with the first reinforcements of his regiment and served at the battles of Ypres, Neuve Chapelle and Loos. It seems likely that Alick was the Cubitt brother riding near the Front who saw a sergeant and stretcher party who had been ordered to carry away the body of an officer who had just been killed and who was of a family of some importance. On asking to be shown the body, he remarked, “My God, it’s my Brother!” and rode away. And the body was that of Henry Archibald. The reasons for this deduction are given in greater detail on Henry Archibald’s page. In short, the 15th (King’s) Hussars (under the command of the 9th Cavalry Brigade in the lst Cavalry Division) were in the same battle in 1916 as Henry’s Coldstream Guards. It will be interesting to hear other people’s views on this supposition. 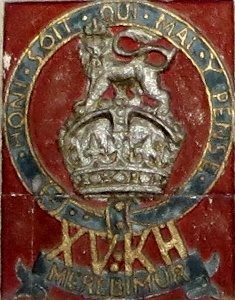 The badge of the 15th Hussars on the wall of the Cubitt Chapel. Whatever the truth of this, in September 1916, on the death in action of his elder brother Henry Archibald, Alick became heir to the barony to which his father succeeded on the death of Alick’s grandfather George, lst Lord Ashcombe, the following February. 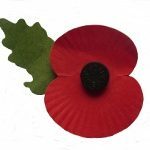 In November 1917, as part of 9th Cavalry Brigade, the regiment was near Bourlon Wood. (When Alick’s nephew Sir Hugh Cubitt and his wife Linda visited some 80 years later, they found the area eerily reminiscent of Ranmore Common.) The horsemen expected the order to move forward and capture the Wood. However, for some reason the horses were off-saddled, watered in nearby ponds and given nose-bags. The dismounted regiment took up positions in sandpits south of the Wood and were then ordered into roughly dug trenches in the front line. There was constant close-hand fighting to capture the village, and among the confusion Alick Cubitt died on 24th November 1917. 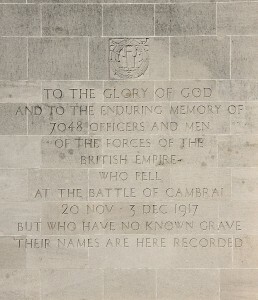 His body was never found or identified, but he is commemorated among more than 7000 other servicemen on the Cambrai Memorial at Louverval. The design of the Cubitt Chapel was modified to commemorate Alick George, and subsequently his younger brother William Hugh who died four months later. The Bible quotation is the first half of Paslm 27, verse 1. The second half of the verse “The Lord is the Strength of my Life, of whom then shall I be afraid” is inscribed on the adjacent memorial to Hugh (photograph Brian Belton). 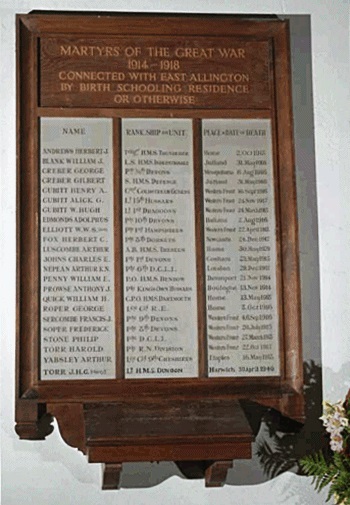 The three Cubitt brothers are also commemorated on the War Memorial in the church of St Andrew, East Allington, Devon. Although this village is very distant from Ranmore Common, the Cubitts owned Fallapit, a house there, and it is probable that this commemoration was instigated by Helen Cubitt, the boys’ aunt, who lived in Devon and was a passionate admirer of the military. 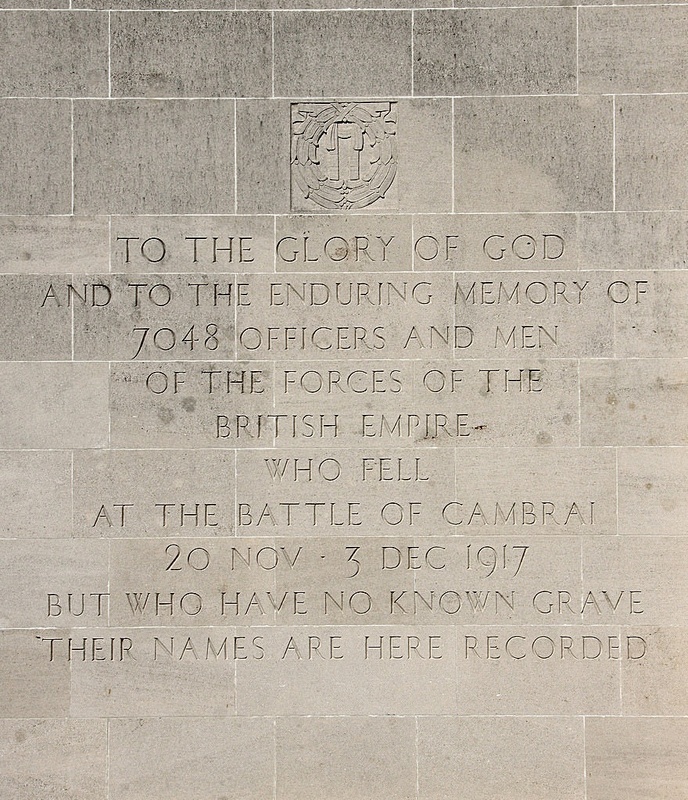 An invaluable resource for these pages on the three Cubitt brothers is “Commemorating the Fallen – The Lord Lieutenant’s Soldier Sons in the First World War and the Making of the Memorial Chapel at St Barnabas Church, Ranmore” by Professor Keith Grieves of Kingston University. A scholarly, fascinating and very well documented article from “Surrey History” (Journal of the Surrey Local History Council, 2000). and reproduced for the Ranmore Archive as a pamphlet. Those interested in following up many of the references on these pages are advised to read Professor Grieves’ very detailed list of his sources.